In business a lot of effort is spent exploring the middle of the market - whether it's understanding what the average person wants, or the mid-point of customer behavior, we search in the middle because it appears to offer the greatest marketing opportunity. The middle has size, the middle has scale, and focusing on the middle fulfills a deep human desire for safety and security. Like many other animals, human beings often gravitate to the middle of a pack during times of danger because in the middle they feel less vulnerable to predators and external threats. This same pattern of behavior can be observed in organizations when executives focus their attention on the middle of a market whilst ignoring patterns of behavior on the edges. Being in the middle seems safer. However, when it comes to discovering trends and opportunities the middle of the market is the worst place for companies to focus. It's not from the middle of the market that trends emerge but rather on the edges, as standard deviations in behavior that eventually become the average. 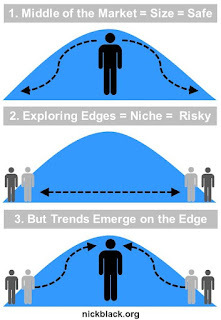 The edges are dynamic and niche but make no mistake, it's from the edges that trends emerge. 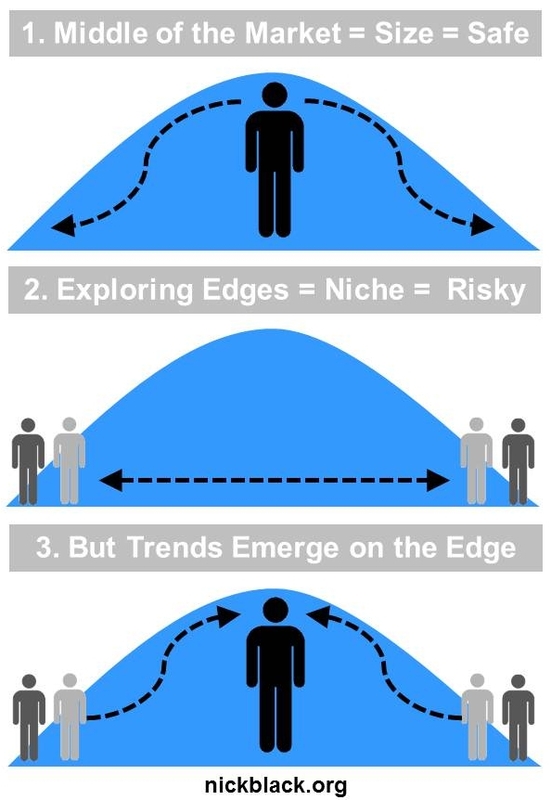 So if businesses want to become more innovative, they need to move away from the safety of the middle and invest more time exploring the edges. Because hidden in standard deviations are future market trends and opportunities waiting to emerge. PS. Thanks Pacific Planning for bouncing these idea around with me last month. Some great food for thought !